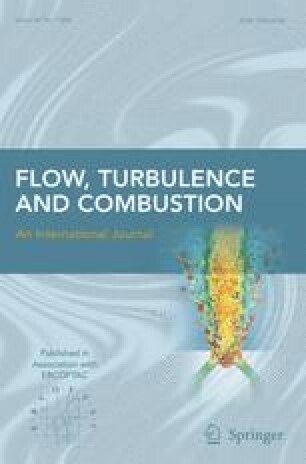 Coherent structures in a tripped turbulent boundary layer havebeen analysed by applying a new conditional sampling algorithm tolarge-eddy simulation (LES) data. The space-time development of theevents and structural characteristics were examined. The new conditionalsampling scheme is shown to be very effective in the eduction of thecoherent eddy structures, allowing the simultaneous detection, trackingand averaging of several three-dimensional (3-D) structures. Alignmentof the triggering events in all spatial directions and flip-averaging(spatial reflection of the samples) enhance significantly the extractionof detailed features of the structures. The detection method minimisesthe smearing of the spatial details and avoids imposing artificialsymmetry, which is often intrinsic to other conditional samplingschemes. The results show the existence of cigar-shapedstreamwise vortices which are directly associated with negative pressurefluctuation peaks (positive source term of the pressure Poissonequation). They are inclined at 12° to the wall andtilted laterally at an angle of 7° to the streamwisedirection. The streamwise vortices induce ejections and sweeps throughan advection mechanism due to the tilting or inclination of thevortices. There is no evidence of hairpin vortices in either theconditional averages or instantaneous flow fields. Near-wall shearlayers are found to be related to the positive pressure fluctuationpeaks as a result of complex interactions between ejection and sweepevents. The shear layer structure has an inclination of10°, being located between two tilted, streamwisevortices of opposite direction of rotation. The presentresults are very close to other Direct Numerical Simulation studiesusing different conditional sampling schemes. Conceptual models for thestreamwise vortices and shear layer structures are proposed to accountfor the results. 1.School of Mechanical, Aeronautical and Production EngineeringKingston UniversityLondonU.K. 2.School of Mechanical and Materials EngineeringThe University of SurreyGuildfordU.K.